The Honest Dietitian: New Orleans Trip 2016: Activities & Tips! New Orleans Trip 2016: Activities & Tips! 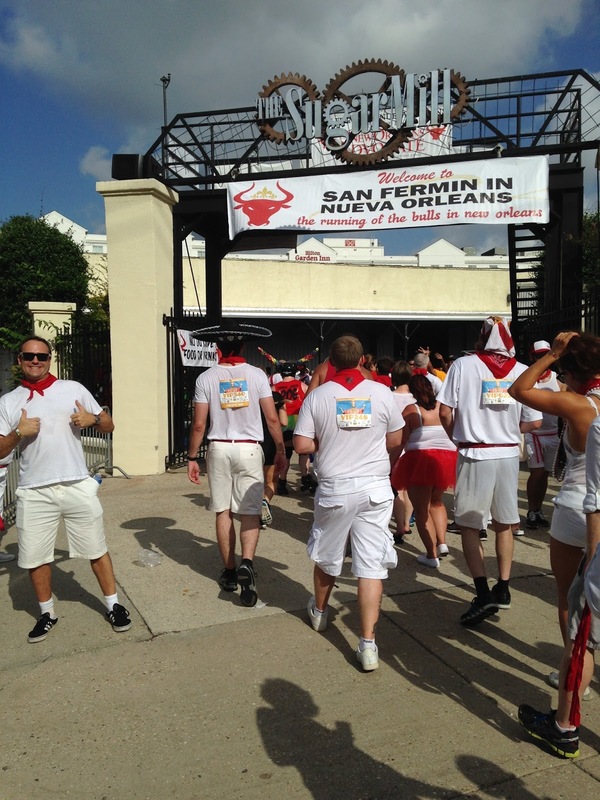 1) The San Fermin in Nueva Orleans: The Running of the Bulls Festival in New Orleans. 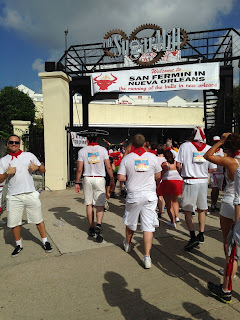 When I was checking the calendar of events for things to do when we were in NOLA in July, I came across the San Fermin in Nueva Orleans and was instantly curious. 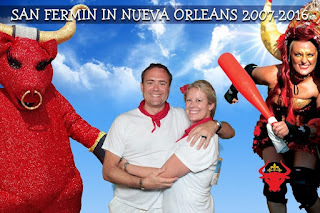 Turns out…you can participate in the running of the bulls…but the bulls…are roller derby ladies strapped with whiffle-ball bats!! WHAT?!?! IS THIS THE COOLEST THING I HAVE EVER READ?!? Yes. Indeed it was. Every single person we met was awesome. The drinks were great. The music was great. Everything about this festival was great. We will be back, hopefully every single year, to participate in this event. We made it to the end of the race! I am a very faithful Marriott girl, but I wanted to try something a little off of the beaten path in NOLA. I found a Groupon for the Hotel St. Pierre and the pictures looked so charming that I had to give it a go. 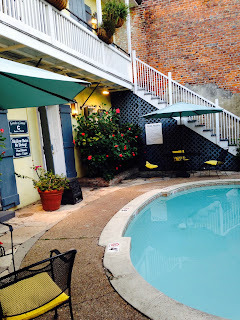 My first impression of the Hotel St. Pierre is that it was like an entire romance/mystery novel laid out in a quaint maze of quiet corners and luscious ambiance. This place was inspirational. The staff was nice, the afternoon cookies and milk were a lifesaver after the running of the bulls, and there are two refreshing pools for cooling off after walking the streets. I read the reviews and will agree that the room we had was smaller than your normal “chain hotel” room, but we were never there but to sleep! The reviews had also warned of “paper-thin” walls, which I can also agree with. We had a bench outside of our room where the 30-somethings would stop and discuss their kids and jobs after a long night on Bourbon Street but they would always quiet down after we politely said something. Plus, I had earplugs. 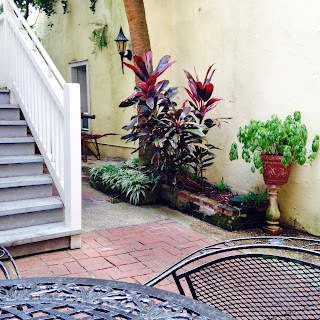 This location was great and not too far of a walk from the French Market & Jackson Square which are “must see” destinations for any NOLA visit. I would hands-down stay there again and if you are a lover of NOLA like we are, I would recommend you give a try too. 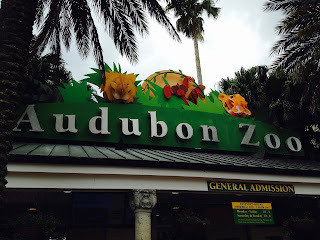 Alex and I had enjoyed the Audubon Aquarium so much on our last trip that we wanted to go check out the Audubon Zoo this time. 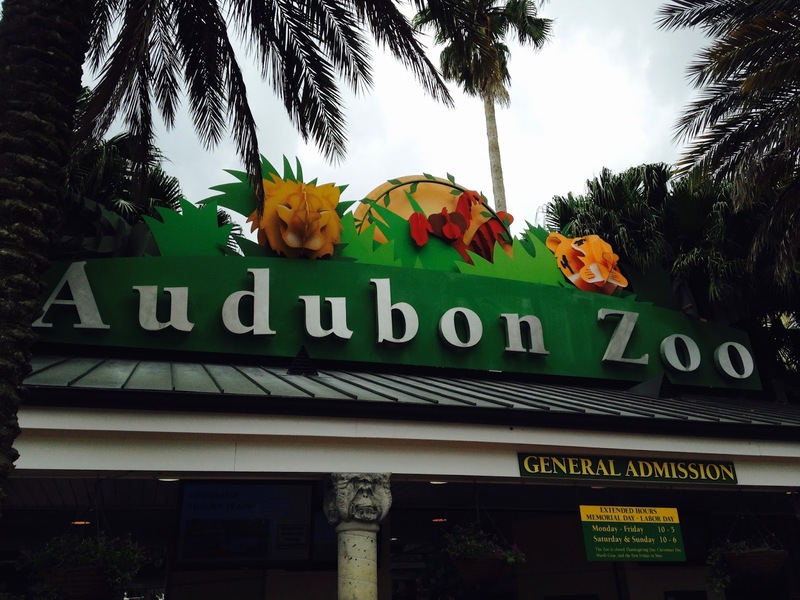 We hopped on the St. Charles streetcar and headed into the Garden District to the Zoo. At the streetcar stop, a complimentary shuttle was waiting to take people to the front of the zoo. It was such a wonderful time! 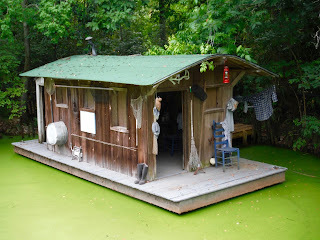 Described as a “Top five US zoo featuring more than 2,000 live animals in natural habitat settings”, there was a fantastic Louisiana Swamp exhibit with alligators that was by far my favorite. Alex loved seeing all of the different primates. Part of the Audubon Nature Institute, there were cougars, bobcats, aldabra tortoise, flamingos, and wildebeest just to name a few! We actually got caught in a rainstorm while we were there, which did not stop us. We were able to get some good food and see plenty of the sites in the rain (there are many indoor areas). I recommend it, especially if you have kids (there is a splash park for the kiddos to enjoy that looked really awesome). Even a rainy day can be fun at this zoo! 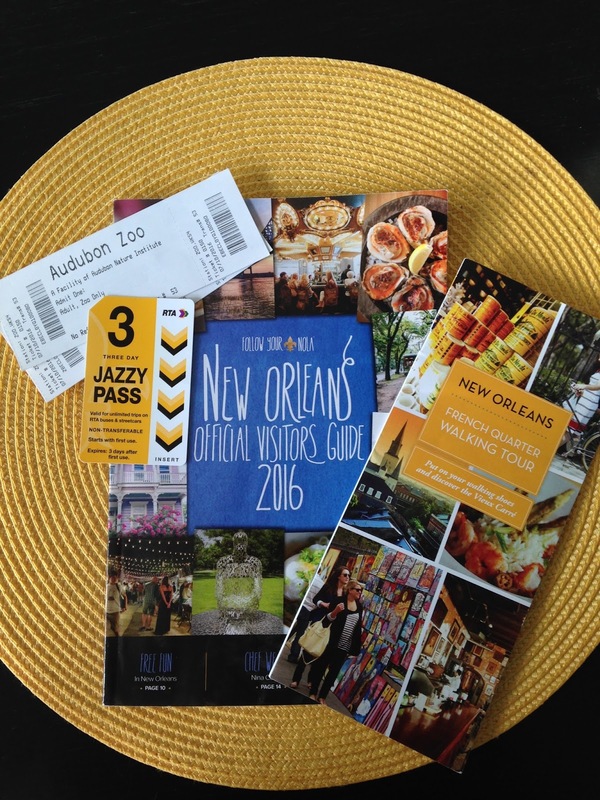 The New Orleans Official Visitors Guide 2016 is unlike any visitor’s guide I have ever seen before. Not only does it have restaurant listing and great coupons, there are unbelievably great tips in this book! For example: 5 Tips for Families on a Budget, Architectural Scavenger Hunt, the what/where/why/how of each of the New Orleans Neighborhoods, 10 Free Ways to Play in NOLA, and my personal favorite- the 5 Walking Tours to Try which are five celebrity-guided walking tours of NOLA that you can walk at your own pace to with the FREE GO NOLA app. Don’t forget to buy your Jazzy Passes at CVS stores (they don’t sell them at Walgreens, but chances are if you see a Walgreens in the French Quarter, a CVS is nearby) so that you can ride the streetcars and buses during your stay. The standard fare is $1.25, but if you get a Jazzy Pass (1-day is $3.00, 3-Day is $9.00, 5-Day is $15.00) you can come and go as you please. We have never used any other transportation (except the taxi to and from the airport) when in NOLA and have had no issues getting anywhere we wanted to go using the public transportation. It’s cool, when you are at a stop they have codes for you to text to tell you when the next streetcar will arrive! Algiers Point Ferry: This was the first time we had taken this ferry. For $2.00 one-way, you can catch the ferry across the Mississippi river for a breathtaking view of New Orleans (plus, it is just fun to ride across the Mississippi). On the other side, in Algiers, there are places to eat and drink, as well as a riverfront bike path. We saw many bikes on the ferry. For just a few dollars, this ferry is a great way to take in NOLA from a different perspective. When it started to rain really hard, Alex and I went to Harrah’s New Orleans. I was so happy to learn that the entire inside of the casino is tobacco-free. I played the penny slot machines and had a few cocktails in the air-conditioning and thought it was a pretty nice time. When we needed to take another break from the weather, we went to see a movie at The Theaters at Canal Place that has the oversized chairs that you can reserve when you purchase your tickets in advance. They have servers who bring you food and drinks while you watch the show. Very fancy and fun!